Free Shipping Included! TMS Kayak Canoe Jon Boat Carrier Dolly Trailer Tote Trolleyw/Free Cell Phone Bag by TMS at Our DXC. MPN: =%Cart-Canoe/Kayak-KY001+CellPhoneBag-K. Hurry! Limited time offer. Offer valid only while supplies last. Capacity : 150 LBS 12 Ft long tie-down strap, easy to install. Solid Metal frame; foam bumpers on each arm to protect your Canoe / Kayak hull. Sturdy double-leg kickstand allows easy loading. Large(9-1/2"D) pneumatic tires (3-1/2" wide) roll smoothly across sand and gravel. Stainless steel fasteners and chrome lynch pin. Quick assembly, only wheels need to be attached. Part of the support stand features a 9-1/4"H spring-loaded stand which keeps the dolly cart propped up onshore for quick loading out of water. Large 9-1/2" diameter inflatable tires provide stable support on uneven terrain which is especially useful in sandy areas. 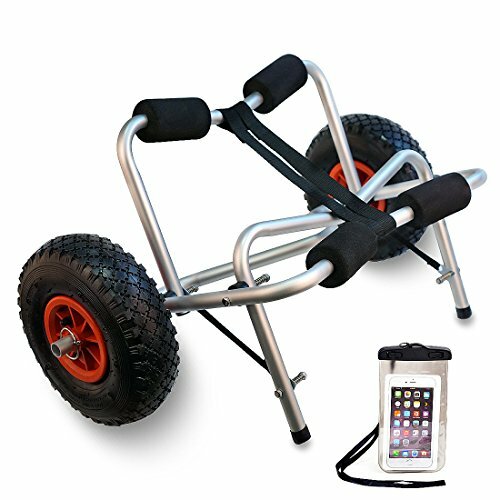 Easily rest a kayak or canoe on the dolly cart platform, strap it down and it's ready to go. It is foldable, easy for storage.